Last year Debbie Staresinic teamed up with Ruah Woods Press and produced the beautiful Theology of the Body Rosary Meditations. It impacted our lives, here at Ruah Woods Press, by allowing us to enter more deeply into the Rosary. Many of you who have encountered these meditations may agree. As Catholics, we are encouraged and constantly invited to search deeper for Christ. We look for tools to assist us in that journey. Here we have just that. 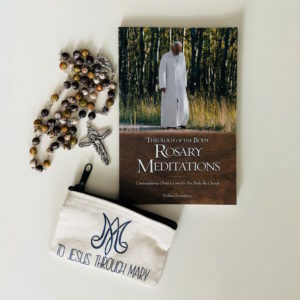 We are excited to announce that with the Theology of the Body Rosary Meditations we are now offering a TOB Rosary Gift Set. This is a beautiful project and undertaking that Debbie Staresinic took on. Debbie explained why she was inspired to complete this project. 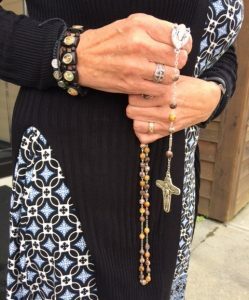 Debbie also expressed her hope with these rosaries and what they would bring to those who purchase and use it. “My prayer is that these gift sets will help people enter more deeply into the mystery of Christ’s love for His Bride the Church. Rooted in the Theology of the Body, the spousal love of God is a central theme woven throughout the meditations in the book. The Unity Cross on the Rosary is a reminder of this spousal love. Interested in purchasing these gift sets? Visit the website by clicking here.